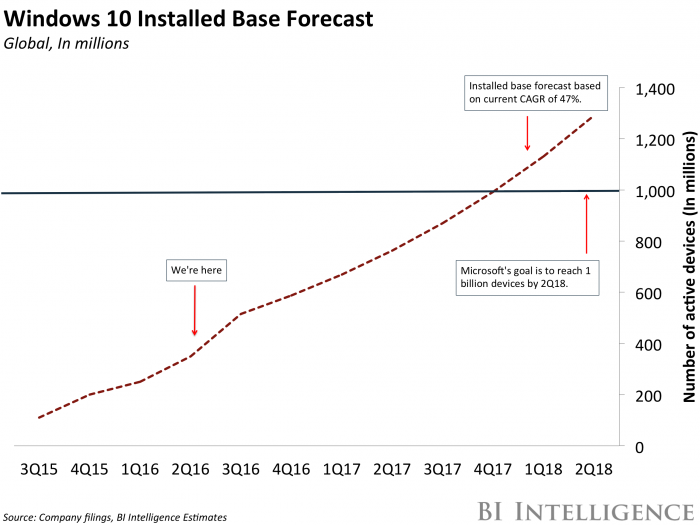 On Tuesday, Microsoft unveiled its latest plans to bolster its share of the enterprise with the announcement of Surface-as-a-Service as well as a new subscription option for Windows 10 called “Windows 10 Enterprise E3 for CSP.” The introduction of these products will encourage consumers to download Windows 10 as the company looks to boost its install rate amid plans to shutter the free upgrade offer in July. Surface-as-a-Service: Microsoft will bundle a leasing plan for Surface devices together with subscriptions to Office 365 and Windows 10. Similar to the leasing programs created by Apple for the iPhone, Microsoft’s Surface-as-a-Service will give customers access to the latest hardware though device upgrade cycles at a more digestible price. Microsoft’s Surface line is the company’s best-performing device. In Q1 2016, Surface revenue accounted for $1.1 billion, representing 54% YoY growth, from $713 million in Q1 2015. Windows 10 Enterprise E3 for CSP: This will give businesses that are a part of Microsoft’s Cloud Solution Provider (CSP) channel access to Windows 10 at a discount of just $7 per seat per month. The company hopes that the discounted cost will boost the use of Windows 10 within the enterprise sector. The new OS is already on more than 350 million devices globally. However, to reach the company’s goal of having Windows 10 installed on 1 billion devices by mid-2018, Microsoft will need to incentivize more consumers to download the OS.